The proposal to provide a new care village aimed at providing accommodation for older residents on the former Lowfields School site has taken a step forward. The Council will decide on 19th July whether to consult residents on a range of options for providing care facilities for the growing numbers of older people in the City. There are currently 33,000 people over the age of 65 and this is expected to grow to 37,000 by 2015 and 40,100 by 2020. Most older people want to remain in their own homes for as long as possible and the “Telecare” system – pioneered by the Liberal Democrat Council in 2006 – has had a major impact. But there are still 286 beds in Council run Elderly Person’s Homes in York. Of these 57 – including those at Westfield’s Windsor House facility – cater specifically for dementia suffers. It is estimated that CYC will need 180 beds providing a mixture of dementia, high dependency, and nursing care in the future. The past 10 years has seen a change in the level of need of people admitted to residential care. As people live longer and stay at home longer those admitted to residential care are often more physically frail. Recent years have also seen a significant increase in the number of people in residential care suffering from dementia which ranges from mild signs of confusion to more acute forms where they are very confused and often demonstrate challenging behaviour. The average age of people entering residential care in York is now 86 years old and the average stay for an older person in CYC homes is 18 months. 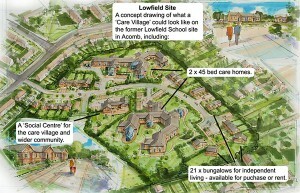 Two 45-bedroom homes are proposed as part of the new “care village” on the site of the former Lowfield School, which could also include the construction of 21 new two-bedroom, independent living bungalows. Two similar but smaller facilities are planned for Fulford and Huntington at a total capital cost of around £14 million. We don’t believe that Council taxpayers will be able to fund this investment so we expect that a private sector partnership is the most likely way of taking the project forward. 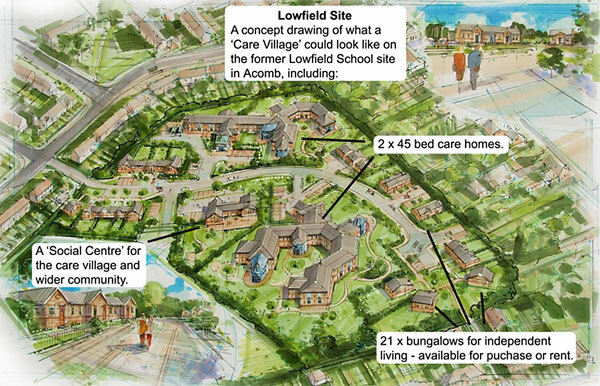 We have always supported the use of the Lowfields site for the construction of an older person’s village. It was the preferred option of local people in our 2010 residents survey. The location has the major advantage of being close to key services in the Front Street area (library, Post Office, doctors surgeries etc.) while also being close to the number 4 ftr public transport route. Similar schemes like Hartrigg Oaks on the other side of the City have been very successful. NB. The review undertaken by the Council did not look at sheltered accommodation like Gale Farm Court and Aintree House which are not affected by the proposals.